Fruit trees are a great investment, the gift that keeps giving! A simple maintenance routine will keep them producing glorious fruit, year after year! Choosing a position with at least five hours a day of sunshine is the key to productive fruiting. A north facing, sunny position is the ideal. If you live in a cooler region, you could grow your trees near a wall that catches the sun so heat can radiate and keep them warm. TIP: Dig in some composted poultry manure into the soil when planting. Super Booster Pellets are ideal. It is important to check that you have quick draining soil as your trees won’t benefit from being waterlogged. If water pools and doesn’t drain away, add some drainage or mound the soil before planting. Once you have planted your citrus tree, water deeply twice a week until established. The frequency can then be scaled back. When the weather is dry or when fruit is forming in spring and early summer, increase the water again. TIP: Citrus plants love water, but infrequent deep watering is the most beneficial. Regular mulching will protect the shallow feeder roots. Keep mulch and grass away from the trunk of the tree to avoid collar-rot. 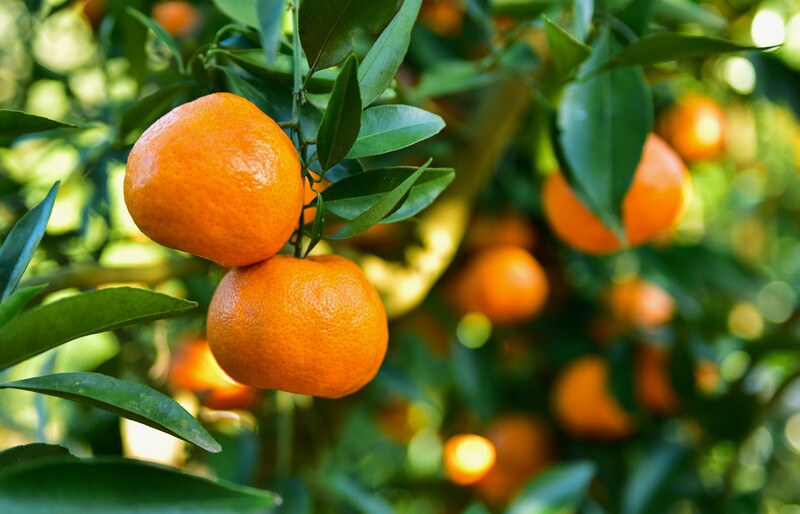 Poultry manure is a great, nutrient rich fertiliser for Citrus Trees. 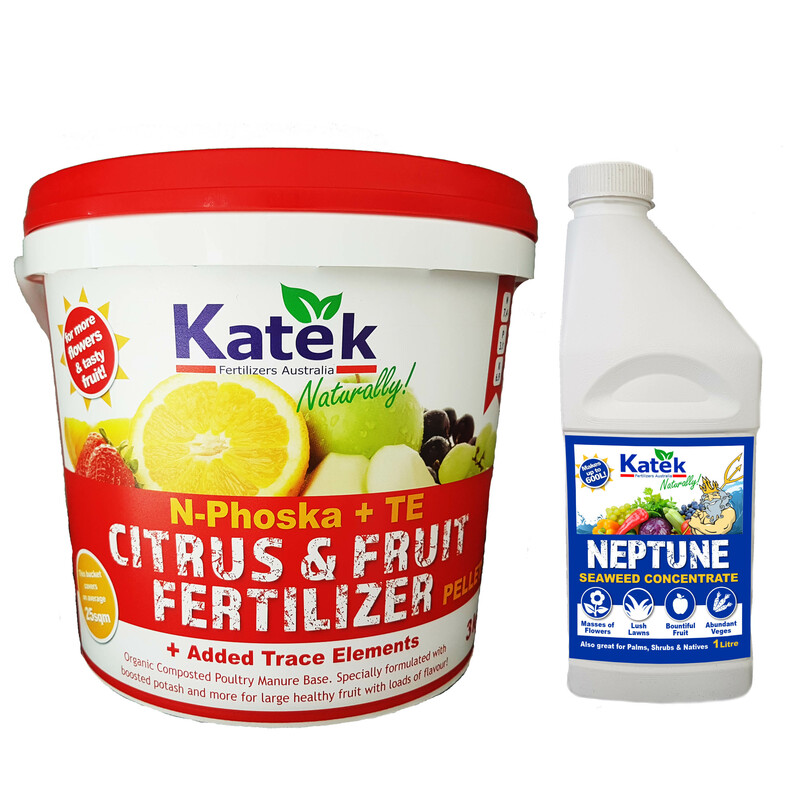 Using a product like Katek Citrus & Fruit Fertiliser that is boosted with sulphate of potash encourages prolific fruit and flower production and enhances fruit flavour. This pelletised fertiliser can be applied every six weeks through Spring to late Autumn around the root zone and out to the drip-line. Fortnightly application of a seaweed concentrate like Katek Neptune during Spring is also recommended. Neptune can be applied to the soil and foliage helps prevent disease, stimulates the soil’s biology and encourages strong and health plant growth. TIP: Composted poultry manure is full of live beneficial microbes and rich in plant available, slow release nutrients. When the tree is growing, prune young shoots to encourage bushy growth. It is a good idea to open up the centre of the plant as this will increase airflow. When they are established, citrus trees don’t need pruning to produce great fruit, but it does help the overall health of the tree to remove dead wood and inward facing branches every few years. TIP: Removing interior branches allows light and air to circulate and will help reduce the risk of disease. See Next Article in the How to Grow Series!